Basement Waterproofing Site with information on the methods and systems for ensuring watertight basements, in both new construction and refurbishment projects. Basement Waterproofing Site has been established by NCC Materials Consultants and Distributors, as a continually developing source of information and support in all types of basement waterproofing for domestic and commercial property owners, plus the below ground waterproofing of all types of other buildings and civil engineering structures. This is intended as a point of reference and a source of technically correct advice for owners, their Professional Construction Consultants and Contractors. Information and advice is provided freely on this site to summarise the options and alternatives for the construction of new watertight structures and new basement waterproofing. However, this site primarily focuses on the bigger market and frequently much tougher job of existing basement waterproofing. This requires the combination of real technical expertise and practical experience to be successful. The site includes information on the different types of waterproofing materials, systems and alternative solutions, which can be internally, integrally or externally applied, in order to meet your specific basement waterproofing project's requirements. The most suitable waterproofing products and systems can then be detailed and specified with FREE support and assistance from the technical waterproofing experts at any of our offices. 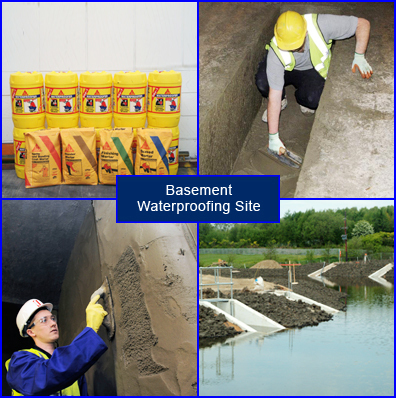 The selection of a good experienced basement waterproofing contractor is the final essential element for the successful waterproofing of existing damp or leaking basements; in order to convert them into habitable and commercially viable, useable and therefore valuable additional space and investments. We work nationwide, throughout the UK, with the country’s leading national, regional and local specialist waterproofing contractors. Therefore we can usually recommend and introduce you to experienced, competent people who can quickly get your basements or cellars completely dry and useable – with all of the works carried out in the most cost effective way and fully guaranteed. At NCC’s Basement Waterproofing Site we provide you with the right basement waterproofing solution and detailed specifications and method statements, plus we can also provide all of the component waterproofing systems and products. These are normally supplied direct from stock in our depots, and all at the best possible prices with fast delivery - nationwide. Please use the tabs at the top or left hand side of this page to check out the information and assistance available on this site relating to your specific project and areas of interest. Alternatively please call any of our offices (details on the left of this page), and one of our technical waterproofing specialist’s will be pleased to advise and assist you. If you already know exactly what you require then you can order here in our online-shop or by telephones from any of our offices for fast delivery that can usually be on your site within 2 days.